These are the 23 defendants in the medical trial. 20 of them were medical doctors, and 3 of them were administrators who had responsibility in the carrying out of the medical experiments. 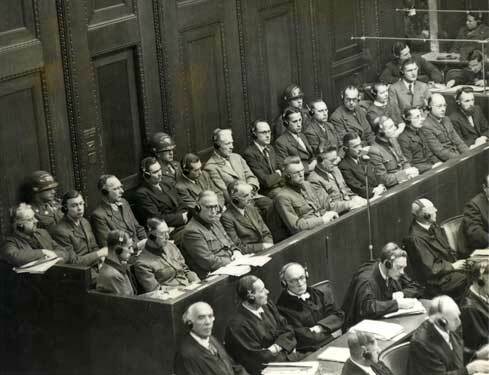 In front of the defendants are the German defense counsels, all of whom were former members of the Nazi Bar Association. Behind the defendants you can see a door, guarded on both sides by American soldiers. Through that door the defendants entered and left the courtroom every day. In the front row, nearest the viewer, is Karl Brandt, Hitler's personal physician. In the front row on the opposite end of the bench sits Wolfram Sievers, the Director of the Institute for Military Scientific Research. Sitting two people to Sievers' right is Rudolf Brandt (no relation to Karl Brandt), Heinrich Himmler's Personal Administrator. Sitting behind Karl Brandt in the back row is Gerhard Rose, the Chief of the Dept. for Tropical Medicine. In the same row, but near the opposite end, is Herta Oberheuser, a physician at Ravensbrueck Concentration Camp, which held only women. The trial was conducted in German and English, with simultaneous translation between the two languages.